After you have made the decision to build a carport instead of a garage, you need to decide on the next step - which carport is the most suitable to you. 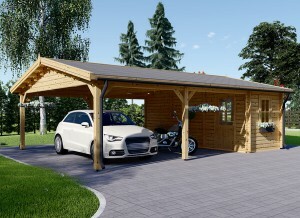 Money wise a carport is a very economical option comparing it to the cost of a garage, while still offering great protection from the sun, wind or snow. Time flies and you are still not sure what design of carport you would like to go ahead with? Here we will share some basic aspects you have to think about before the final decision as to which carport is ideal for you. To start with let's discuss what the difference is between the carport and the garage. A carport structure could be simply described with one word - shelter. The structure is an alternative design to a garage which has lower cost because it is not an enclosed building. It is a simple construction with four or six posts and a roof, which is more than enough to shelter any vehicle. The simple construction does not mean that you are limited when it comes to designs as there are different roof options which can add a very cozy look to your garden. What about the materials? Carports are available in wood, aluminum, steel, and fabric. The most popular type is wooden carports as they give such benefits as low price, easy construction on site and a wooden construction looks great in any surroundings. This is the classic choice and even though they are made from wood they offer different types of durability, which could increase the price. What are the elements you need to protect your vehicle from? It might seem counter-intuitive but the design of the carport has to be chosen according to what elements it will have to withstand. If you are located in a very windy area, the carport structure has to be ready to stand the heavy winds. The construction will need to be stronger and this will contribute to a higher cost. It’s not wise to try to save money here as you can put yourself and others at risk. If you live in a snowy region, then the key point is that your wooden carport has a snow loading allowance built into the design. The purpose of the wooden carport is to be a shelter for your car from snow, rain and direct sunlight, so choose the option which can stand the most extreme weather conditions in your area. There are a lot of types of wood used in the construction business. The type is not only to give different patterns of the logs, it offers durability as well. Basically wood is classified into hardwood and softwood. Some types of wood look wonderful but it does not mean that they are sturdy and durable. So pay attention not only to how the design looks, but from what wood it is made from. This will ensure that the structure will last as long as you are expecting. Furthermore, the best option is to go for a slow-grown timber as this wood is naturally more resistant to such threats as mold and rot, meaning you get a combination of a great look and long lasting performance. If the logs used to construct the carport are not thick enough, then it will lead to damage especially under complicated weather conditions. The best constructions are made from 10 thick posts. The 13 cm x 6 cm uprights guarantee that the carport will stand stable and hold up the roof of the carport. The weather will not have any impact on the items sheltered in such a carport. The roof construction is as much important as the thickness of the upright. The most reliable wooden carports are made with reinforced beams and triple triangular roof frame construction. 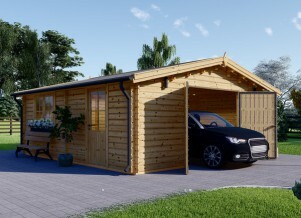 All the described specifications provide you with a safe and strong wooden carport. There are two main options of roof construction you will need to choose from and these are either a gable roof or flat roof. For rainy and snowy areas it is better to have a pitch roof. The roof finish should be beautiful and trustworthy at the same time, which is why 5-layer bitumen shingles are one of the most popular roofing types for carports. They are durable, easy to install and heat resistant. There are also different colors like green, red and black which can satisfy your wish to adapt the carport to any other buildings on site. 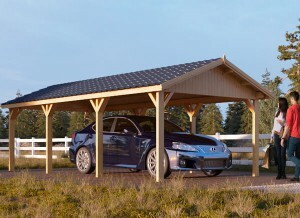 Where to buy the carport? There are many options but basically you can either buy it from a retailer or from the manufacturer. Buying from the manufacturer is often a preferred choice as this can easily guarantee the quality of the product. You can ask any questions and they will be answered with all the details, and of course manufacturers can offer better prices than retailers. The easiest way is to hire the same company to manufacture and install the product. This is a cost-effective and simple way to organize all the process. 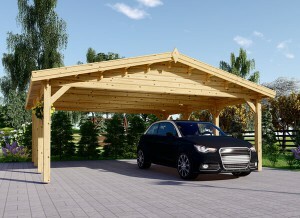 Often we make the price the highest criteria for a purchase, but this should not be the case when choosing a carport. The product has to be safe and long lasting. Choose the one with a competitive price which meets the quality standard. We have just basically finished our wooden 3 bay carport but want to make a change and our Contractor has left us high and dry and will not return texts emails or calls. When I go visit he hides out. I have a technical question. Our carport is 32' wide and 22' deep. It has a 4/12 pitched flat roof. If I add a 2' eyebrow on the high side to make it look like a salt box roof would this be considered a gable roof? Hi Royce - sorry to hear that! It probably would be considered a gable roof but if your concern is building permit please refer to your local authorities.